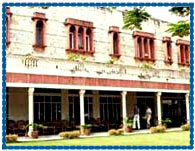 Hotel Arya Niwas Jaipur, Arya Niwas Hotel Jaipur, Reservation for Hotel Arya Niwas, Jaipur, India. Address: Behind Amber Towers, S. C. Road, Jaipur  302001 Rajasthan, India. Accessibility: 13 kms. from Airport, 2 kms. from Railway Station, 1 kms. from Bus Stand. Hotel Arya Niwas is located in the heart of Jaipur. It is an old haveli building, family managed, award-winning hotel with all modern amenities to provide quality accommodation within everyone's budget. 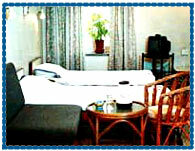 Hotel is the ideal place to rest, relax and rejuvenate maintaining the old world charm of the place. Hotel Arya Niwas offers 90 well furnished, tastefully decorated with traditional frescoes rooms overlooking courtyards or gardens. All the rooms have attached baths, with shower or bathtub and western style water closet, colour TV sets with cable TV connection, telephone on EPABX and tea/coffee/cold drinks service. Business Center, Broadband Internet Surfing, E-mail and Fax, 24 Hour Long Distance Dialing, Secretarial and Photostat Services, Same Day Laundry, Doctor on Call, Foreign Currency Exchange, Wheelchair Access, Conference Hall, All Major Credit Cards Accepted, Exchange Library and Reading Room, Travel Desk, Sovenir Shop, Bookstore, Cultural Shows and Theme Dinners, Cafeteria, Standby Backup Generator.